Treasury Secretary Steven Mnuchin flew on a government plane to tour the Fort Knox gold vault. While there, he also watched the total solar eclipse. Treasury Secretary Steven Mnuchin's Aug. 21 flight to Kentucky is now being reviewed by the Treasury’s Office of Inspector General. The inspector general's counsel told The Washington Post the investigation will "determine whether all applicable travel, ethics, and appropriation laws and policies were observed." This official review comes after a left-leaning watchdog group filed a Freedom of Information Act request for records tied to Mnuchin's trip. Citizens for Responsibility and Ethics in Washington claimed Mnuchin took the trip to get good view of the total solar eclipse — which he did see with Sen. Mitch McConnell at Fort Knox. 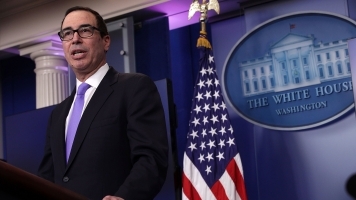 The group said, "The requested records would shed light on the justification for Secretary Mnuchin's use of a government plane, rather than a commercial flight, for a trip that seems to have been planned around the solar eclipse." Treasury officials said Mnuchin's trip was scheduled around "official government travel." While in Kentucky, Mnuchin toured the Fort Knox gold vault. He also attended a Louisville Chamber of Commerce meeting with McConnell. Prior to the FOIA request, Mnuchin's wife, Louise Linton, posted about it on Instagram and wrote that a critical commenter was "adorably out of touch." She later apologized. Earlier this week, a treasury spokesperson confirmed Mnuchin reimbursed the government for Linton's travel expenses, also saying the White House approved the trip.